The Gospel Music Association (GMA) announces more performers and presenters for the 47th Annual GMA Dove Awards. 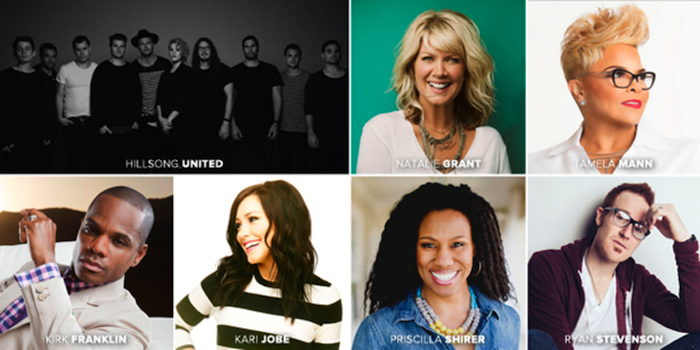 Hillsong UNITED, Natalie Grant and Tamela Mann will perform. Donnie McClurkin, KB, Priscilla Shirer and Ryan Stevenson will present. These new appearances join already announced performers TobyMac, Anthony Brown and Group TherAPy, Steven Curtis Chapman and Hollyn. Blanca and Travis Greene will host the pre-telecast. Hosted by for KING & COUNTRY and Tye Tribbett, the awards show will take place on Tuesday, October 11, 2016 at Lipscomb’s University’s Allen Arena in Nashville at 6:30 p.m. CST. Trinity Broadcasting Network (TBN) will exclusively air the awards show on Sunday, October 16. Tickets are now on sale at the Allen Arena box office or online. Top nominated artists include Lauren Daigle, Hillsong UNITED, Chris Tomlin. Kirk Franklin and Bill Gaither. View the full list of nominees at http://doveawards.com/2016-nominees/. The GMA Dove Awards celebrate the contributions of artists from every style of Christian/Gospel music. Nominees are determined by over 1,600 professional members, and winners will be voted on by the entire GMA membership of nearly 2,500. For more information, visit www.doveawards.com. This entry was posted in Christian Contemporary, Gospel and tagged he 47th Annual GMA Dove Awards, performers, presenter by Kris Patrick. Bookmark the permalink.